We can all admit to taking an extra lollipop or two from the bank counter or the pediatrician’s office – and who can blame us? 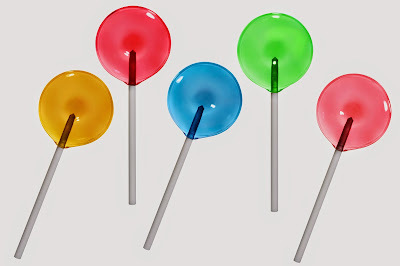 Lollipops have been a fan favorite for centuries for both adults and children alike! But did you know that lollipops are actually very simple to make on your own at home? Today we will walk you through the steps on how to make your own lollipops with only a few simple ingredients. Prepare your station by lining two cookie sheets with wax paper and filling a large bowl with ice water – set both aside. Next, combine your sugar and corn syrup in a small saucepan over medium heat. Quickly stir the mixture and bring the heat up to medium high, stirring until all of the sugar is dissolved. Continue to stir your mix for five minutes, and immediately place the saucepan in the bowl of ice water, carefully making sure that no water seeps into it. Let the pan sit in the bath for 10 to 15 seconds to allow to cool. If you are using a flavoring accent, this is your time to add a few drops. Speed is important in our next step – pour your syrup mixture into small circles, making sure to space them out wide enough so as not to mix them together. Immediately press the sucker sticks into the drops, and dust the lollipops with small candies or colorful sprinkles. We even love making glamorous-looking lollipops by adding tiny decorative edible pearls! Let your lollipops cool completely before pulling them off the baking sheet and enjoying! If you want to skip measuring out your ingredients, try using our easy Isomalt Crystals for making your lollipops for other hard candies. These reduced calorie crystals are perfect for making guilt-free treats at only 2 calories per gram, and can be made just by adding water. Or, if you prefer chocolate over hard candy treats, try any of our chocolate and candy melts and pour into a Lolly Mold! Have you ever tried making your own lollipops or hard candies? Was it for a special occasion or just an experiment? Share photos of your delectable creations with us on our Facebook page!